Looking for a budget-friendly coffee maker that costs less than a hundred bucks? You can put either Mr Coffee Optimal or Keurig K-Classic into your consideration. Both of them are relatively affordable. However, Mr Coffee Optimal vs Keurig K-Classic come with very different features and advantages. So, read the comparison below to find out which one that’s best for you! First, let’s take a look at the design and overall dimensions. There is no point in buying a coffee maker that you can’t use because you can’t fit it into your kitchen or office room. However, the overall dimensions of these coffee makers are quite similar. The differences are not dramatic. See also: Mr Coffee Optimal vs Cuisinart. Mr Coffee Optimal measures 13.11 inches wide and 8.7 inches deep. The height is about 14.33 inches. It has a distinctive box shape with a reflective metallic finish that looks nice and stylish. Most of the housing is actually plastic, the build quality is good. The housing feels durable and sturdy. On the front side, you can find a control panel that features a small LCD screen and several buttons. The screen will show the clock when the coffee maker is idle. The screen will serve as the interface when you are dialing brewing settings or programming a brewing schedule. Keurig K-Classic measures 9.8 inches wide and 13.3 inches deep. It measures 13 inches tall. This coffee maker will take slightly more surface area. Nevertheless, it comes in a beautiful and elegant curved body with a matte finish. The construction is also mostly plastic, but it is well-built and definitely durable. The control panel is found on the top. Unlike Mr Coffee Optimal, Keurig K-Classic does not have a display screen. Instead, it uses only a few simple and intuitive buttons and light indicators. In order to start brewing coffee, you only need to press a single button. Of course, simplicity and convenience have always been major traits of coffee makers from this company. One important thing to consider when choosing between Mr Coffee Optimal vs Keurig K-Classic is whether you prefer to use ground coffee or pods. If you are a die-hard coffee enthusiast, Mr Coffee Optimal will be a better choice for you. However, if simplicity and quick brewing are the most important factors for you, Keurig K-Classic is the way to go. Mr Coffee Optimal works with ground coffee. Most serious coffee lovers will say that you need fresh coffee beans that you grind yourself in order to get the best quality coffee. If you want to use high-quality coffee beans to make your coffee, this model should be your choice. Even if you don’t have the time to grind manually, you can just buy pre-ground coffee. However, Mr Coffee Optimal won’t be as practical as Keurig K-Classic. Grinding coffee beans manually will require a stand-alone grinder as well as some time and effort. If you use pre-ground coffee, it still won’t be as quick, as you still need to determine how much ground coffee to use and perhaps add sugar or milk manually. So, this model is not recommended if simplicity and quickness are what you need. Keurig K-Classic works with K-Cup pods. It is very easy and simple to use. In order to make a coffee drink, you just need to enter a pod and press one of the brew size buttons. The machine will automatically adjust the brewing settings according to the information from the pod. It is great for busy people who don’t really care about high-end quality coffee and just want to get some caffeine for the day. While Keurig K-Classic is really practical, it won’t be able to deliver high-quality coffee. It also lacks customization options. It simply brews according to preconfigured settings, so you can’t alter the brew strength or temperature. The next difference between Mr Coffee Optimal vs Keurig K-Classic is the capacity. The bigger the water reservoir capacity, the less often that you need to refill it. You definitely want a large water reservoir capacity if the coffee maker is going to be used by several coffee drinkers, so that you won’t need to refill the unit too frequently. Mr Coffee Optimal has a larger capacity. It can brew up to 10 cups of coffee in one brewing cycle. The water reservoir is removable, so it should be easy to refill. It will be good enough for personal use, family, and office environment. 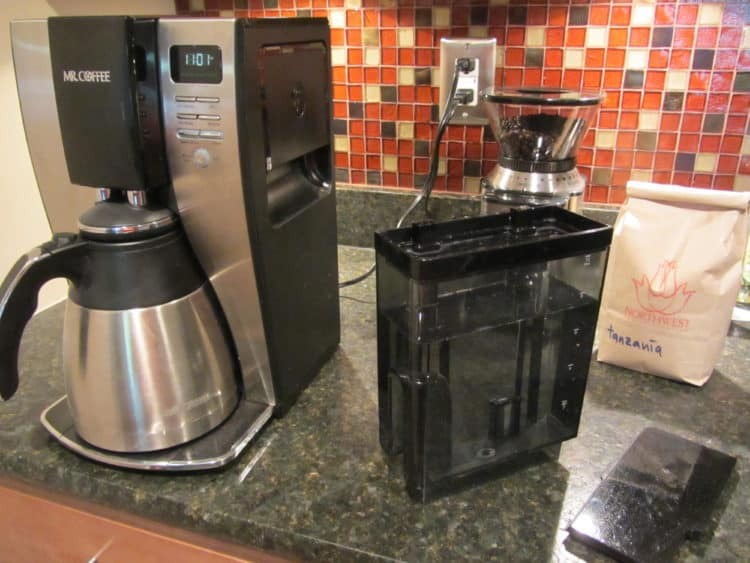 Keurig K-Classic comes with a 48-oz water reservoir, which is also removable for easy refilling. This capacity should allow you to make 5 – 8 cups of coffee per refill. It will be good for personal use or for serving just a few coffee drinkers. 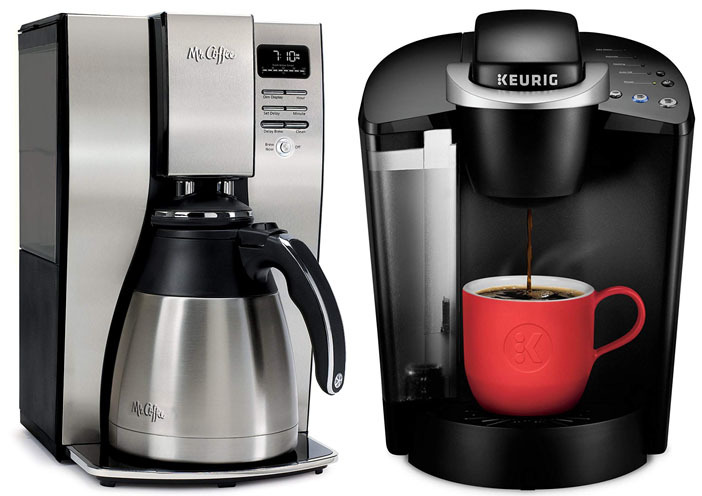 The features of Mr Coffee Optimal vs Keurig K-Classic are very different. Mr Coffee Optimal has a better edge here due to having a bigger feature set. 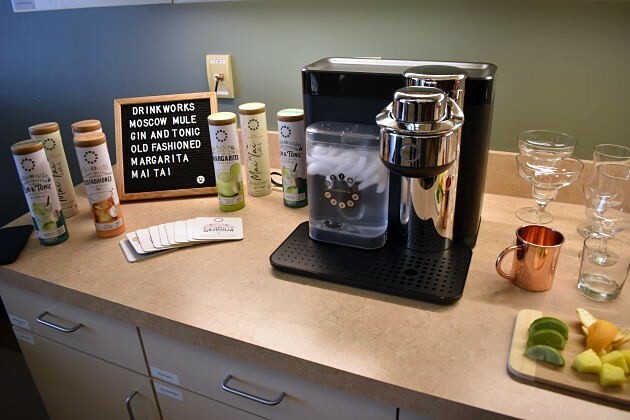 On the other hand, Keurig K-Classic relies on its simplicity and ease of use to attract potential buyers. Mr Coffee Optimal is a programmable coffee machine, meaning that you can set it to automatically brew coffee at a certain time every day. By programming the coffee machine, you can have fresh coffee every morning by the time you wake up. This is really great. It comes with a stainless steel thermal carafe, which does a pretty good job in keeping the coffee hot for a few hours. Mr Coffee Optimal has a brew pause function, which will allow you to pause the brewing process temporarily to sneak a cup of coffee without having to wait for the carafe to be full. In addition, there is a built-in cleaning cycle which will purge the internal parts to maintain coffee quality, taste, and performance. Keurig K-Classic is not programmable because it takes an entirely different approach. After inserting a pod, just press one of the brew size buttons, and the brewing process will start immediately. This coffee maker can make 6 oz, 8 oz, or 10 oz brew sizes. The brewing takes only less than a minute. Keurig K-Classic is also equipped with a programmable auto-off function. By default, it will automatically turn off after being idle for two hours. This feature will give you some peace of mind, as you don’t need to worry if you forget to turn off your coffee maker after going to work. Mr Coffee Optimal is pretty good. It is able to brew coffee with recognizable flavor notes. The temperature is also good, as the produced coffee is actually hot. Unfortunately, since it also runs on preconfigured settings, you can’t really adjust the brewing process. The brew intensity is rather weak, so you won’t be satisfied if you typically prefer bold and strong coffee. Keurig K-Classic is slightly better in this aspect simply because it can take various K-Cup pods. There are many options of drinks available, including dark roast coffee, decaf coffee, and special blends from notable brands. You can get tasty coffee drinks simply by pressing a button. The produced coffee is hot and nice. However, the brew intensity is also rather weak, so you won’t get any intense coffee flavor. Finally, let’s see in what colors that these coffee makers come. Mr Coffee Optimal does not have many options, but the style should be versatile enough to fit into a wide range of kitchens. On the other hand, though, Keurig K-Classic offers several color options, so you can easily find one that suits your taste as well as your kitchen’s interior. On Mr Coffee Optimal, there are only two color options: Chrome and Black/Chrome. Actually, these two variants look quite similar. The only difference is on the front panel. The Chrome only has a few black accents on the front, while most of the surface has a beautiful metallic finish. Meanwhile, the Black/Chrome variant has a black part at the center, but the rest is still the same metallic finish. Both variants look modern and stylish. On Keurig K-Classic, there are at least four color options. There are Black, Patriot Blue, Rhubarb, and White variants. So, if you are looking for a more colorful unit, this coffee maker can be a better choice. The different colors can suit a wide range of style and taste. They generally look modern, simple, and streamlined. - Descaling: an important part of cleaning your Keurig brewer. This process helps to remove calcium deposits, or scale, that can build up inside a Coffee maker over time. Please refer to our descaling video for step by step instructions. In general, Keurig K-Classic is more recommended. The main advantage of this coffee maker is the simplicity. It is very easy and quick to use. In addition, it can make take a wide range of K-Cup pods to make various drinks. The coffee quality is pretty good, though it won’t give you strong or intense coffee.